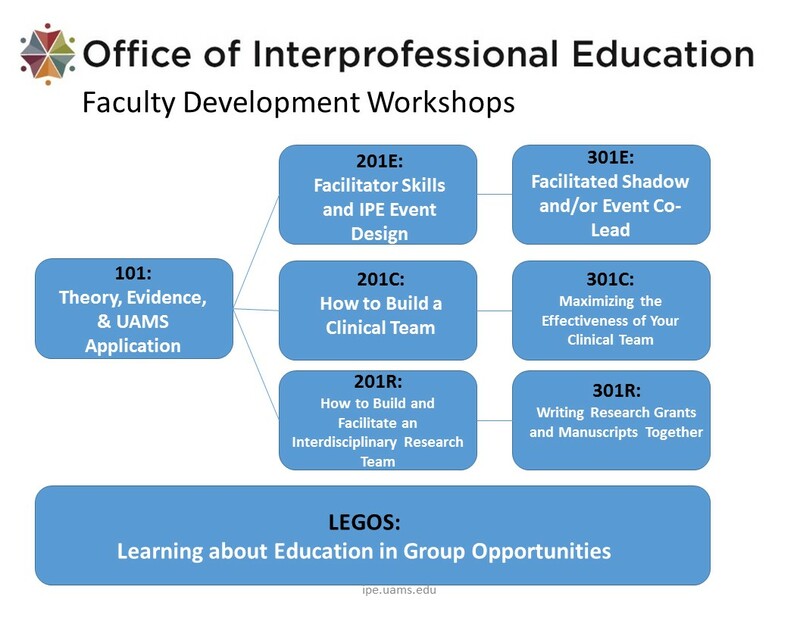 Trained facilitators are necessary to facilitate the diverse IPE events planned for UAMS students across the institution and to develop new IPE events. Target audience: All faculty are welcome, this seminar provides an overview of the international movement toward Interprofessional Education and Collaborative Practice, as well as the evidence-base behind the movement. Further, it outlines how UAMS is applying IPE concepts and methods in our IPE student curriculum which facilitates students learning about core competencies in collaborative care and provides experiences for them to practice these skills while learning about, from, and with each other. **The 101 is available as an online module on LearnonDemand. Summarize the political, economic, and social forces moving care models toward interprofessional team collaborations and its potential benefits to stakeholders. Develop a business plan which outlines the team expansion needed in attendee’s clinical area including who should be added, how the team will function together, and both short and long term outcomes. Target Audience: any faculty member who would like to build (or expand) an interprofessional clinical team. Summarize the skill sets contained within the four core competency domains associated with interprofessional collaborative practice. Develop an action plan to improve the effectiveness of the team’s functioning in a minimum of 3 areas. Target Audience: This workshop is designed for teams; thus a minimum of four members of an existing team (from different professions) should attend. A self-evaluation 8 weeks prior to the workshop is required of attendees, where they self-report their current team functioning in a variety of areas. Target audience: All faculty interested in learning how to facilitate interprofessional faculty or student events and/or would like to learn how to design and implement a new IPE event. Practice skills by co-facilitation with confidential, structured feedback (both quantitative and qualitative). Develop confidence and competency in IPE facilitation skills as a final step of the certification process. Target audience: All faculty interested in certification as an IPE Facilitator are welcome. To become certified as an IPE Facilitator, faculty must shadow an IPE event and then schedule to co-lead an IPE event with observation and structured, confidential feedback. To become certified as an IPE Master Facilitator, faculty must shadow three different types of IPE events and then schedule to co-lead each of them with observation and structured, confidential feedback. Summarize the national forces moving scientific investigators toward collaborative team approaches to complex research questions. Target Audience: All faculty interested in learning ways to network, build, and facilitate an interdisciplinary research team. Target Audience: All faculty interested in learning ways to maximize the effectiveness of interdisciplinary grant writing and manuscript creation. Learning about Education in Group Opportunities (LEGOS) courses are offered on a monthly basis on the 1st Wednesday of every month (barring holidays) from 12:15pm – 1:15pm in EDII-B107. If you can not attend in person, we have also offer online courses. Each module is typically available one month after it has been presented live.